Mmmmmmm. I talk a great deal about “Comfort Food.” This recipe is one of the all-time family favorites and there are oodles of variations. Not only is Chicken Pot Pie satisfying, and yummy, it also uses leftovers in a most delicious way. Use cooked chicken or turkey and any combination of cooked, leftover or frozen veggies. This is a wonderful, frugal recipe, sure to please! In a sauce pan, melt the butter, brown the flour. Add cornstarch, tamari and garlic to broth. Add to browned flour and whisk until thickened. Add cut-up chicken and veggies. Mix well. Place mixture in an ungreased 9 x 13 inch pan. Make cutouts with Light and Fluffy Biscuits recipe and cover the mixture with the biscuit cutouts. Per Serving: 230 Calories; 10g Fat (37.6% calories from fat); 17g Protein; 21g Carbohydrate; 5g Dietary Fiber; 51mg Cholesterol; 405mg Sodium. Exchanges: 0 Grain(Starch); 2 Lean Meat; 2 Vegetable; 1 1/2 Fat. 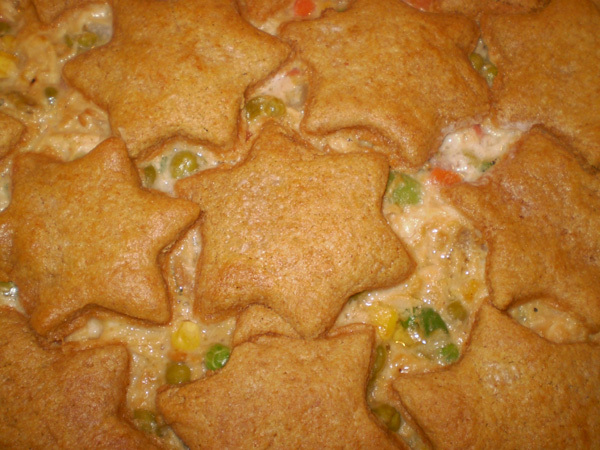 For Pot Pie biscuit topping, roll the dough to about 1/2 inch thick and cut out shapes to cover the pot pie filling. With remaining biscuits, place them on a parchment-lined cookie sheet and bake alongside the pot pie until golden. 1. Preheat oven to 400F. Line a baking sheet with parchment paper. Using a pastry blender or two table knives, cut in cream cheese and butter until pea-sized lumps form. Stir in buttermilk with a fork. Gather the dough into a ball and knead it several times in the bowl until smooth. 3. Turn the dough onto a lightly floured surface. Pat into a smooth,1/2-inch-thick disk. With a 3-inch cutter, cut out rounds. Repeat with dough scraps until you have 10 biscuits. Brush tops with milk. Place on the baking sheet and bake until golden, 15 to 20 minutes. Per Serving: 132 Calories; 4g Fat (29.9% calories from fat); 3g Protein; 20g Carbohydrate; 3g Dietary Fiber; 12mg Cholesterol; 318mg Sodium. Exchanges: 0 Lean Meat; 0 Non-Fat Milk; 1 Fat; 0 Other Carbohydrates.